One of the most commonly asked questions by the parents in Music Mood is “What is Suzuki Method?” So in today’s sharing, we are going to explore more about this teaching method and should you go for Suzuki violin lessons. To begin the discussion, let’s first understand what exactly is the teaching philosophy behind Suzuki Method. 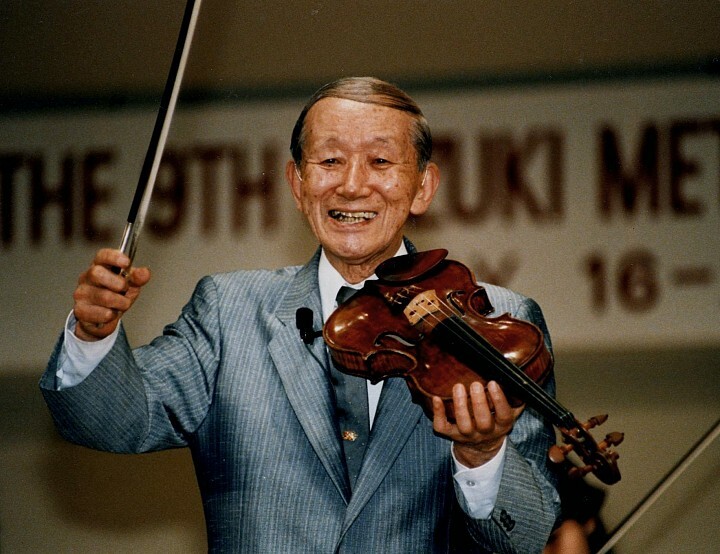 The Suzuki method (also well known as the Suzuki movement) is a method of teaching music conceived by Japanese violinist Shin’ichi Suzuki (October 17, 1898 – January 26, 1998). He was a violinist, educator, philosopher, and humanitarian. This method comes by when Dr. Suzuki was studying in Germany. He realized how easily the children could pick up the language where he was struggling to master it. He also realized that all Japanese children could easily learn to speak Japanese, a highly complicated language. After more thoughts, he realise that the environment where the children live plays a big part in his ability to learn. He then decided to adapt his teaching method and philosophy to enable kids to play music as naturally as they would pick up a new language. He believes that all children could learn music the way they learnt their mother tongue effortlessly through listening, imitation and repetition, and that they had to be taught with love, affection and encouragement. Dr. Suzuki based his approach on the belief that “Musical ability is not an inborn talent but an ability which can be developed. Any child who is properly trained can develop musical ability, just as all children develop the ability to speak their mother tongue. The potential of every child is unlimited. The Suzuki teaching philosophy is well received in the world, and spreading from Shin’ichi Suzuki’s home country, Japan, to all over the world. Due to the universality of the concept, the Suzuki teaching method has also been adapted for us with various instruments apart from the violin (e.g. the flute, recorder, piano, guitar, cello, viola, bass, organ, harp and voice). In the same way as parents encourage their children to speak as soon as possible, we believe that there is no minimum age when your kids should start learning using the Suzuki method. We encourage kids as young as 4-5 years old, to start to learn music. The younger they are, the faster they can learn the skills. Children learn to understand a language about two years before they are able to speak it well. Using the Suzuki method, we follow this natural learning process by playing the Suzuki repertoire (practice songs) over and over again months before they learn to play the actual piece. Suzuki parents need to encourage their child’s musical progress and reinforce their desire to learn. Suzuki students from all over the world can communicate through the language of music. Just like how children practice their mother tongue whenever they meet friends and family, in the Suzuki method, kids learn to hone their skills and also socialize through our regular group classes, where they can play the violin with children of their age. In the Suzuki method, nothing is more critical than YOUR support. We view parents as one side of successful Suzuki triangle concept, where success of the child depends on engagement of teacher, parents and the child himself / herself. Repetition is the key to a child’s pace of learning a new language. In the Suzuki method, we have designed the curriculum such that the key concepts are repeated (and reinforced with each repetition) with little variants added on for each new stage. As such, your kids will benefit from the reinforcement of the key concepts, just as they would in learning a new language. We all know that most of the children do not learn a language by reading first, but rather by listening to those around them speak it. Similarly, in the Suzuki method, our children are taught to appreciate a musical piece by listening to it first, as compared to the traditional method of teaching a song based on the musical score. Reading of musical scores will take place when your child is ready, but before that, don’t worry! Your child will learn to play just by ear alone.